This beautiful old window has outlived the original frame and been rehoused in a substantial pine frame. It was removed from an Old property in Lytham St Annes in Lancashire during refurbishement. The Hand Painting on this window is truly beautiful. This glass seems to glow with a light of its own in the half light at dawn or dusk or sometimes on a cloudy day. It is an attribute of this heavy old glass to collect and softly diffuse the colours of the light falling upon it. 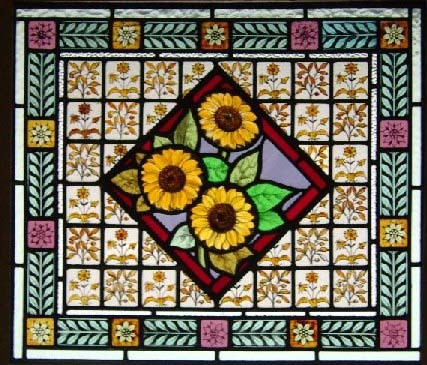 The hand painted Sunflowers in the central medallion are crisp bright with little sign of fading. The frame measures 30"w x 27"H The glass measures 26 " x 23"